Breakfasts during the school year in our house aren't big affairs. Cold cereal, oatmeal, yogurt. Easy and quick so we can get out the door without much fuss. I am not a morning person, so the thought of turning the stove on at 6am is absolutely revolting to me. June Cleaver and I would not be friends. Now that school is officially out for the summer and I can get a few extra hours of sleep every day, breakfasts can be more of an elaborate affair. Nothing too fancy and not every single day, but it doesn't bother me to put in a little extra effort for the girls to have a home cooked breakfast a few times a week during the summer. I think part of the reason I like summer breakfasts so much is the abundance of delicious fruits available to us this time of year. 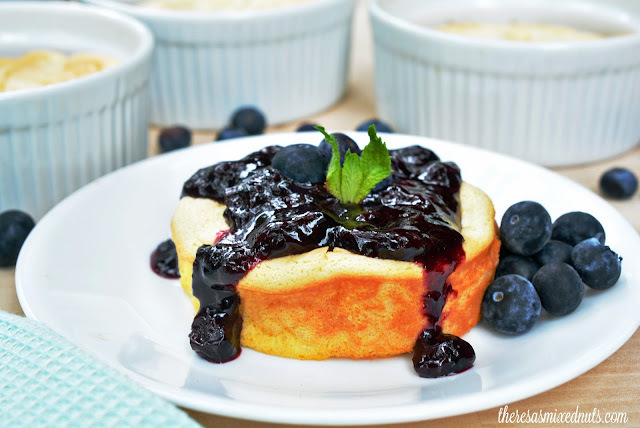 Lately, I've been stocking up on tons of blueberries, usually for waffles, but I found an amazing recipe for Breakfast Souffles with Fresh Blueberry Sauce on Golden Blossom Honey recently and couldn't wait to use some of them up on this recipe. This is such a delicious breakfast, it can almost be mistaken for dessert. Eat it for breakfast, brunch, or make a few extra and snack on them anytime throughout the day. What do you like to eat for your home cooked breakfasts? I turn on my stove and oven each day at 7AM :) since I cook my lunch very early, whilst still sleeping basically, to avoid the rest of the people in the house, and so that I can finish all the housework and start my work after 9AM :) And it is easier cooking early in the morning during summer before the noon temperatures hit the hellish degree. June Cleaver would be so disappointed lol meh, I just eat the same old and on with the day. This looks so wonderful. I could replace the blueberries with the juneberries I have tons of. Nom Nom! Oh wow! If that's breakfast at your house, I think I need to move in That looks absolutely amazing! This looks amazing! I would definitely eat this for breakfast or brunch any day! I've never made souffles before. We eat eggs for breakfast almost every morning, but Saturday. Saturday is our special breakfast morning and I make french toast or something else yummy! I'll have to add souffles to the Saturday rotation! I ask for something like this every mother's day. The blueberry sauce mixed with syrup is my favorite topping for waffles. I know what I will be making soon, this looks delicious! These souffles sound like the perfect weekend breakfast! Blueberries are totally in season right now too, so those will be easy to incorporate. I'm completely with you on the early morning breakfasts. I'm not a morning eater so I tend to wait until late morning early afternoon before I eat anything. This recipe sounds like something I'd love to give a try for brunch one of these days! Would you believe I've never made a soufflé? I always thought it'd be horribly complicated. Thinking this needs to be my first attempt. I haven't eaten a soufflé but this looks very tempting. I like the fresh blueberry on top, but it is not available here, can I use canned instead? I have never tried to make my own souffle before but it looks so delicious I might have to try. I definitely will add the blueberry sauce! I have never made a souffle before. My family would love this for breakfast. I will have to get the ingredients i need to try this recipe. You have made so many interesting and creative recipes using honey! This is no exception. OH my gosh does that ever look appetizing! It's totally worth trying using some delicious fresh berries! Oh this looks just delicious. I love fresh berries too so this would be great on those and one toast! YUM! I am such a huge fan of homemade breakfast! Pass the extra blueberries, yum! This looks absolutely heavenly! I will have to give it a try on my family this upcoming weekend. Give me all the blueberry sauce. OMG this sounds awesome. That souffle looks so good. I have only ever had a chocolate souffle and it was amazing.